The IDF’s new “Trophy” system intercepts a Gaza terrorist anti-tank missile for the first time. Helicopters hover over Gaza after RPG attack. The IDF’s new “Trophy-Windbreaker” system intercepted a Gaza terrorist anti-tank missile for the first time on Tuesday evening. It was successfully tested in training last year but had not been employed in the Gaza area until Tuesday. The system is designed to actively protect against anti-tank missiles, and it identified and intercepted the missile. Shortly afterwards, IDF soldiers identified several terrorists in the area and fired in their direction, identifying a hit. The IDF also deployed helicopters over the central Gaza area of Khan Yunis after terrorists fired a rocket-propelled grenade at an army vehicle patrolling on the road at the Gaza separation/security fence. Gaza sources said the RPG set the vehicle on fire, but military spokesmen said there was no damage and that no one was injured. 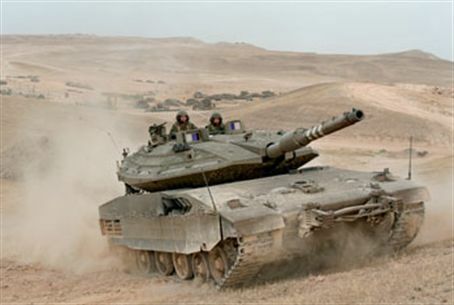 Hamas sources also reported that the IDF retaliated with artillery fire, wounding one terrorist.